While I am not one who likes to be surprised, I love to surprise others. It is easy to surprise Steve. And it is easier still to do that by doing something I enjoy doing with him. It is MLB playoff time. We watch baseball from Spring Training to the final out of the World Series. Last year and this year I managed to “pull off” surprise trips to post-season games. While we enjoy the regular season competition, there is nothing like the post-season. Like Emeril says, they “kick it up a notch”. 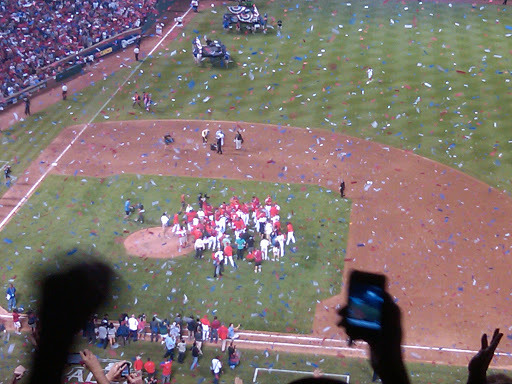 In Atlanta last fall, we saw game 4 of the NLDS. “Fear the Beard” and all of his friends descended on “The Ted” from San Francisco. Great game even though Atlanta cratered. What really got me was the intensity. Of course it was Bobby Cox’s last year (turned out to be his next-to-last game) and that was huge. Tomahawks going wild in the stands and LOUD! San Francisco went on to win the whole thing and we could say we experienced a part of that. Fast forward a year. By now, I have sort of figured out how the post-season thing works for non-season ticket holders (before the left overs get to StubHub and the prices jump up!) So after game 1, I buy two tickets to game 6. That is totally based on presumption that there is a game 6. I did read the fine print (Steve often accuses me of not doing that) so I knew that the refunds are automatic if there is no game 6 played. I even lined up a hotel in Arlington, the dog-sitter (thank you Brenda), and had leave approved. And then I started silently pulling for the Tigers to win two so it would come back to Texas for game 6. And win they did. It was a great series (in fact the post-season to date has been great). Close games. MAJOR home runs. Lots of strategy (though neither Jim Leyland or Ron Washington made near as many trips to the mound as Tony LaRussa), and without a doubt, bullpen by committee. Amazing. Well well well – the Tigers took two at home and back to Texas they headed and I got to tell Steve we were going with them. At least he did not look at me in total disbelief but he had not figured out that was I was up to something either! So off we head west Friday afternoon. We have always enjoyed just being in the car riding and this trip was no exception. Other than the Dallas traffic (and I thought Atlanta was bad the last time we were there), things went without a hitch. Even had some Texas BBQ for lunch on Saturday. The best combination of things happened. 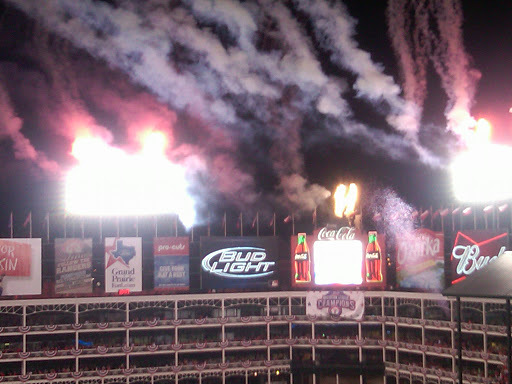 Ranger Win! ALCS clinched! 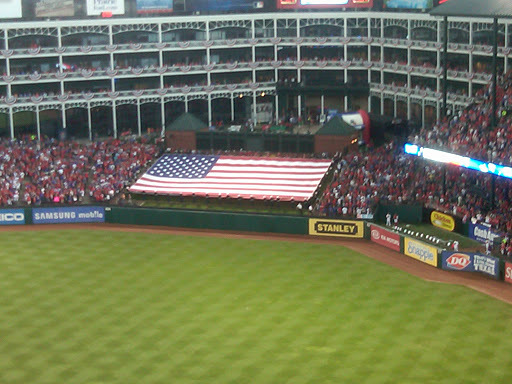 All on our first trip to the Rangers Ballpark at Arlington (which is a terrific facility). 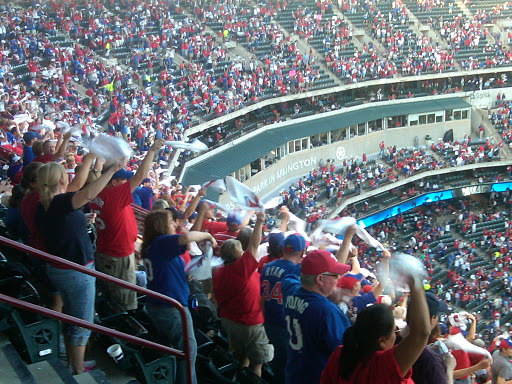 Texas Rally Towels going wild! 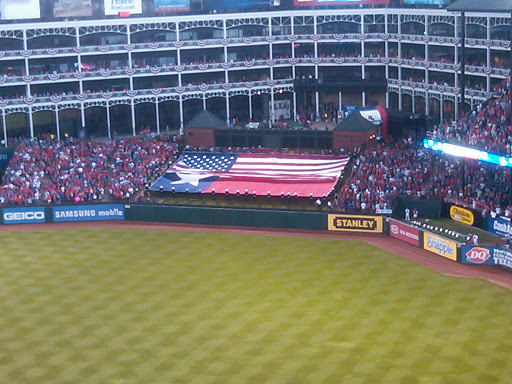 Just before the National Anthem, this flag was unfurled. And then this change happened! It was my favorite chill bump moment! Rangers Win! Fireworks go off! Fans go CRAZY! It was raining red, white, and blue as the celebration began! 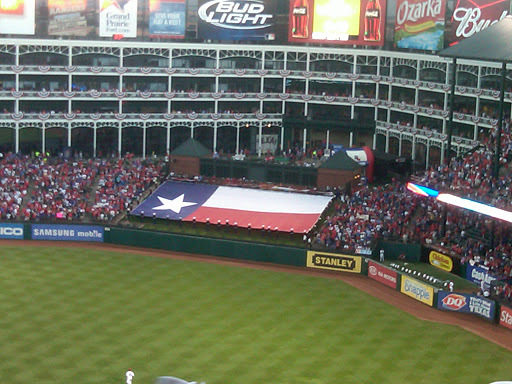 We sang The National Anthem, God Bless America, Take Me Out to the Ballgame, and of course, Deep in the Heart of Texas and We Are the Champions! It was a great time together and we are thankful for that. We did see the terrible drought conditions in Texas and pray for those folks and restoration of the land by sufficient rain. Just waiting now for first pitch Wednesday night (of course, I will be at choir practice but Steve will text me if anything important happens) and I will put it in high gear getting home. I am not certain I care who wins. I do want it to go to seven games (selfishly) because after that it is four months until catchers and pitchers report for Spring Training. Steve will pull for the Cardinals, no doubt, and I am thinking I will pull for Texas just to make it interesting.